The first time we saw Crater Lake we couldn't believe our eyes! The lake was so blue, and so LARGE! We stood in awe ... and wondered how a lake this big and beautiful could be at an elevation of over 6100 feet!. Plus, the lake was over six miles across. 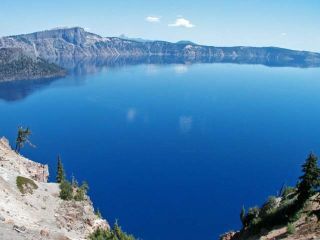 This 'Blue Lake' is a great example why it is one of the best Oregon attractions! 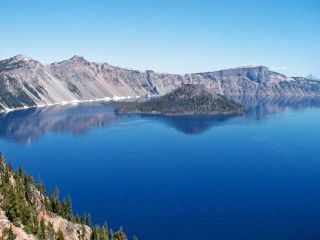 Have a great story about Crater Lake, the Lava Beds, a fishing trip, a restaurant review - Your Klamath Vacation? Share your story by clicking here! 2) There is something to do all year round! Snow-tubing. On the way to Crater Lake there are several snow parks or once you get there you can park your car and walk to a great location along the rim drive (the rim drive closes as soon as the snow starts falling). Cross-country skiing anywhere in the park. It’s the favorite place to go whenever friends and family come to visit. On one particular visit we took some friends from Florida to Crater Lake National Park on the first day of summer and it started snowing! The rim drive – 33 miles (53 km) around the lake with more than 30 turnouts where you will get a different perspective of the lake. Allow 2 to 3 hours. Great place to camp. Click on the link below for more information. Backcountry Camping - a backcountry permit is required. Stay at the lodge. Click on the link below for more information. Hiking - walk to the top of Mt. Scott or take a less strenuous (45- minutes both ways) hike along the rim near the lodge to an overlook. Click on the link below for more information. Bicycling - allowed on paved roads and on Grayback Drive. Wildlife Viewing - deer and ground squirrels are the most visible. Go fishing. A fishing license is not required. A boat tour. It will be unforgettable! Reservations are required and don't forget your ticket before you start the 1.1 mile trek down to the boat dock. For the more adventurous - you can go swimming in the lake. I've done it and it's cold but a once in a lifetime experience you'll never forget! Watch the park film at the visitor center. Click here to see photos of our boat tour. Click here for more information about hiking opportunities. Click here to learn more about camping opportunities. 3) A great place for a romantic weekend! My wife and I spent four days at the lodge to celebrate one of our anniversaries. What a wonderful sight to see the sunrise over the lake from our bedroom window! We enjoyed the variety of weather, reading a book by the fire, going for a hike, playing board games, and meeting new friends. Click here to learn more our stay at the Lodge. 4) But the main reason it's the best day trip - you don't have to do anything but enjoy the view. One of our favorite spots is on the east side of the lodge where we can sit in one of the rocking chairs. If these are all taken then we can walk a short distance down one of the paths and find a quiet seat to take in the view of the lake and Wizard Island. Click here to see more photos of this beautiful National Park. 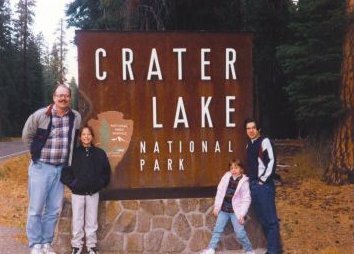 Here you see my two sons Tim and Josh, my daughter Laura, and me the first time we visited Crater Lake. (This sign no longer exists.) Of course, this was the first of many trips. 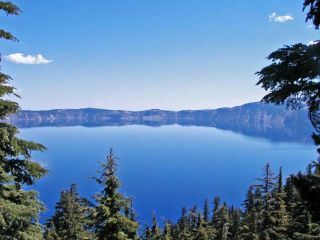 The Best Time to Visit Crater Lake: We like to go anytime in the year, but if you want to do the rim drive, go on a boat tour, or stay at the lodge, the best time is in July, August, and September. As soon as it starts snowing the North Entrance and the rim drive are closed and the only access to the park is using the South Entrance. The Best Way to Get There: From Klamath Falls – take Hwy 97 North to Route 62 North to the South Entrance. From Medford – take Route 62 North to the South Entrance. From Bend – take 97 South to Hwy 138 West to the North Entrance. Food and Dining: The Crater Lake Dining Room offers fine dining in a casual lodge experience. The Annie Creek Restaurant, located in Mazama Village, serves meals buffet style. The Rim Village Cafe serves sandwiches, soups, salads, snacks, and hot and cold beverages. The Mazama Village Store sells groceries, camping supplies, firewood, and gasoline. Visitor Centers: There are two visitor centers in the park - Steel Visitor Center (daily from 9 to 5) open all year and the Rim Visitor Center (daily from 9:30 to 5) from June through September. The Rim Village Gift Shop is open all year and the Annie Creek Gift Shop is open Memorial Day weekend to Labor Day weekend. Junior Park Ranger: Kids between the age of 6 and 12 can become a Junior Park Ranger. Pick a free activity book at either visitor center. Explore the park and return the book to a ranger. Finish 4 pages to earn a Sticker. Complete 8 pages to earn a Junior Ranger Badge. Other Things to Consider: The high elevation can be a problem for some people. If you become short of breath find a place to sit and relax a few minutes. Plan to bring a light jacket or sweater. Even in the summer months it can be cool. And don’t forget your binoculars!